Kuwait – 26th of March 2019: Suprema Boats, the prominent motor boat manufacturers based in Bahrain, has announced its impending participation in the upcoming 7th edition of the Kuwaiti Yacht Show. Started from today till the 30th of March 2019, Suprema Boats involvement will mark its inaugural debut and include a highly anticipated product reveal. Commenting on the company’s first-time contribution to the event, Suprema Boats Sales Director, Jeremy Tutt, stated, “As the Kuwait Yacht Show has grown to become a solid fixture on the calendar of the region’s most highly touted annual boat shows, we are excited to take part in this year’s 7th edition. Witnessing the Show's great success in the six previous years, we felt that the Kuwait Show was the perfect venue for the launch of our new Suprema Boats 36'. The exhibitor and brand base for the show has more than tripled in recent years, securing enthusiastic support from Kuwait’s Ministry of Commerce and industry. Adding to its impressive collection of dependable builds, the industry is in eager anticipation of the official unveiling of Suprema Boats latest fleet addition. Set to debut at the Kuwait Yacht Show for her global launch, the Suprema Boats 36 was crafted in the purpose built Bahrain-established Suprema Shipyard, and becomes another one of the company’s patented performance motor boats. Fast, modern and sporty, it’s Italian master builders have brought decades of experience to build a stable and dynamic hull design. With a 23-degree deadrise deep V hull designed to plane early, it guarantees clean lines with excellent sea keeping capabilities and amazing performance in any sea condition. Maxing out at a powerful 55 knots, it picks up pace from 0-45 knots in five seconds and achieves maximum power with up to 3 x 350 hp engines. The high quality in house upholstery, used for the Suprema Boats 36 combines the very latest marine materials with high UV resistance and water resistance. Superior stain resistance and improved wear-properties keep the premium upholstery consistently protected and looking new. Built with a highly acclaimed glass fibre layup, the 36 is a build of incredible strength and durability.. 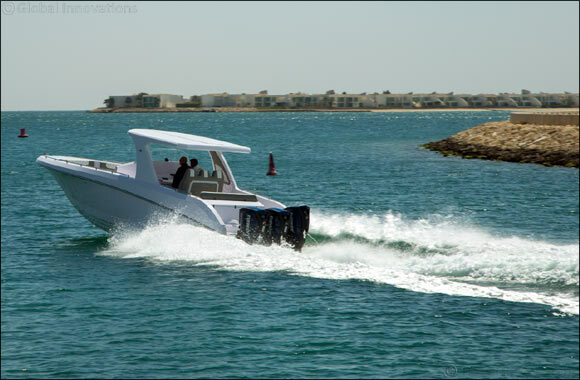 Furthermore, its uniquely structured, sleek GRP hard top also comes with expandable bimini arrangement and is built into the hull sides to create maximum deck space. Suprema Marine will be at the Kuwait Yacht Show, from March 26th to 30th. For the show’s entire duration, the Suprema Marine fleet will grant visits on board.